I have a confession to make. I have a degree in geography and earn my living as a travel writer. But if you’d have asked me a year ago if there was such a country as Abkhazia I’d have probably laughed and asked you if that was the country where Tom Hanks came from in the movie The Terminal. In case you’re wondering, I’ll save you the trouble of Googling: Victor Navorski came from Krakozhia. Abkhazia, in contrast is real, though as a breakaway state, the United Nations does not yet consider it a fully-fledged country. In fact, only Russia, Nicaragua, Nauru and Venezuela recognise it as an independent nation. The Georgian government still insists Abkhazia is part of Georgia. Yet despite this, it is perfectly legal to visit and the Georgian border officials recognise Abkhazian visas. Thus, it was too tempting to pass up the opportunity to visit while so close to the other side of the border. For all practical intents and purposes, the war for independence ended with a 1994 ceasefire agreement and the area’s no longer an active conflict zone. I’d read that banditry at the border could be an issue, particularly after dark. The advice seemed to be to get going early which would ensure any hold ups at the border wouldn’t leave you vulnerable. Armed with a wallet full of rubles and a piece of paper from the Abkhaz authorities sent via email, I headed out of Zugdidi for the short taxi ride to the border. I arrived at the border shortly after 8am. 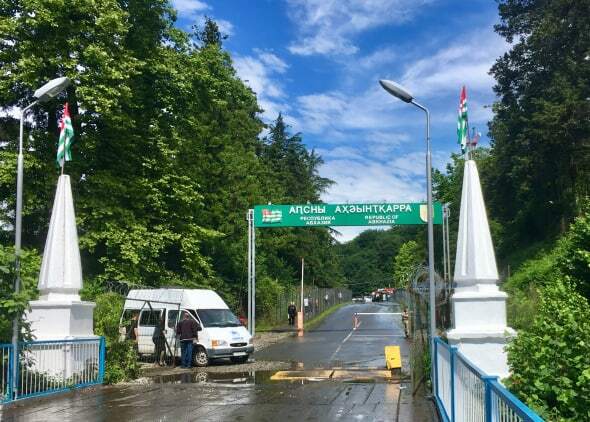 But instead of being granted access to walk across the bridge to the Abkhazia entry checkpoint, I was ushered into the police office. A stern looking official signalled to me to sit down. I waited. They had my passport on the desk. For almost two hours, I waited, unsure whether I’d be given permission to cross, while a steady stream of people were waved past with no questions asked. A little after ten, the boss arrived. In silence, I was processed and shown the door. They had given me permission to go but, it would seem, they didn’t have to like it. On the opposite side, a cheery official in army fatigues studied my passport. Learning I spoke no Russian, he ushered me to sit down on what looked like it had once been a 1970s British bus seat. “Hello. American?” people asked. Soon, another soldier arrived; this time he knew some English. A few questions later, I was on my way. Gal, the scruffy border town at the end of the bridge, bears visible scars of war in the form of burnt out and abandoned homes. Fortunately, there was a marshrutka waiting so I only saw it from vantage point of the minibus window. 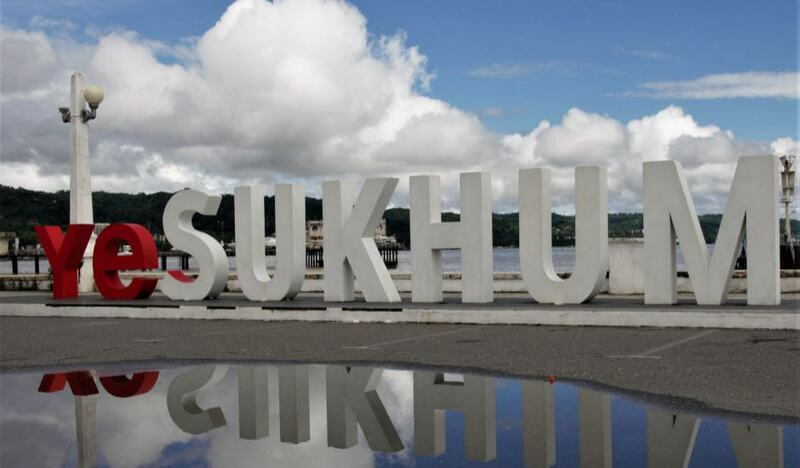 Sukhumi, the capital, a two-hour ride away, is also only part way through reconstruction. 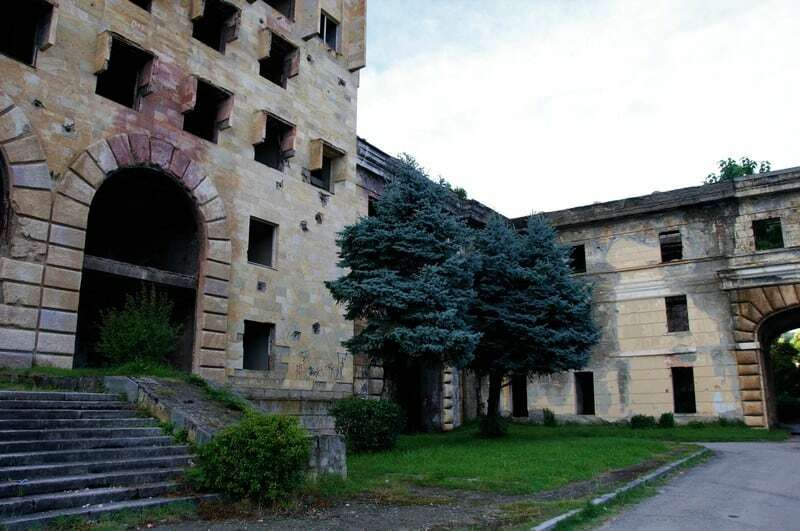 The hulking Government Palace is the most noticeable landmark to await renovation, overgrown with weeds, riddled with concrete cancer and leaking like a sieve every time it rains. Nearby, the office where I collected my visa was in better condition. My hotel, located on the edge of the town centre, was modern, clean and comfortable, though its name – Inn Dom Kupca Shaposhnikova – was a bit of a mouthful. I wandered down to the waterfront. This Black Sea resort has been beautifully renovated and was packed with Russian tourists who’d made the journey from nearby Sochi. The promenade was lined with pavement cafes where twenty-somethings drink coffee and smoke cigarettes. Families soak up the sun on towels laid out on pebbly beaches and mothers give in to their children’s demands for ice cream. 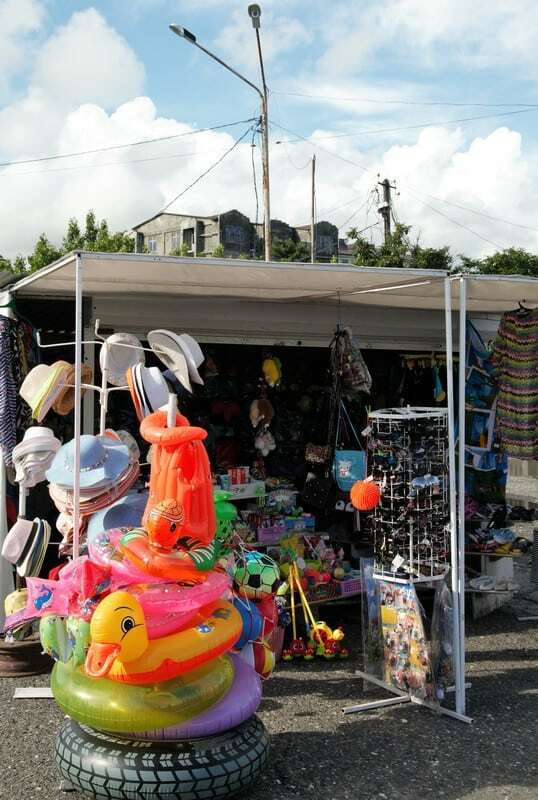 You can buy a rubber ring and a sun hat, play fairground games and eat pizza washed down with a cold beer. It’s not too dissimilar to Southend, if I’m honest, but with better weather.